Indigo Career – Hello, friends welcome to Aviation Dreamer. If your dream is to join in the airport as a ground staff! then yes you can do that now. So, friends today I will give some latest interview updates of Indigo Airlines AOCS. 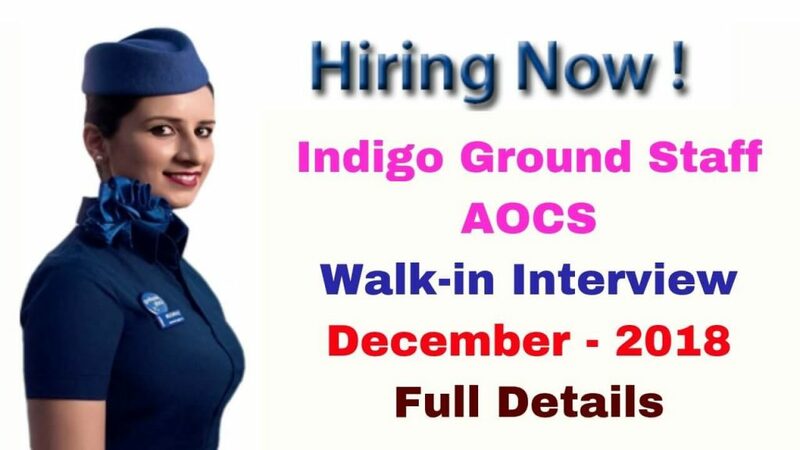 Yes, friends my today’s topic is Indigo Career of Ground Staff or AOCS Walk-in Interview for Dec 2018. Interview Venue – Hotel Royal Orchid, Tonk Road, Jaipur. Educational qualification should be graduation from any recognized board or university and its prescribed by Indigo Airline. If at any stage, before or during the employment of the candidate, it is found that the requisite qualification or the requisite qualification from recognized board or university recognized by Indigo is not met, the proposal of such candidate for such employment or employment It is liable to withdraw or terminate. Preferred Skills: Good communication skills, customer service qualifications, open to working in rotating changes, able to work under pressure. How should we go? There should we make first online application for this??? no its a walk-in interview so you can go directly …..
dear sir…now any vacancy reported in calicut airport?